The testing was very successful. 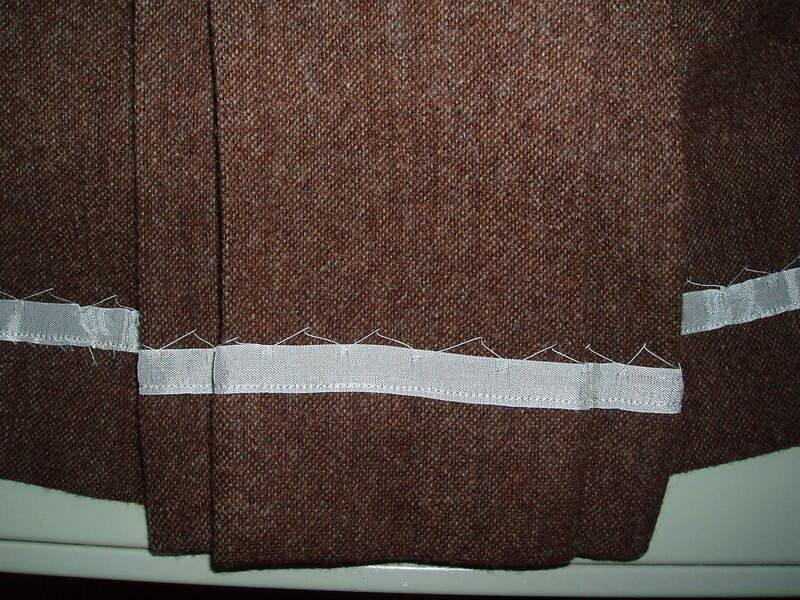 I cracked my knuckles and got to marking my buttonholes and button placements on the skirt. 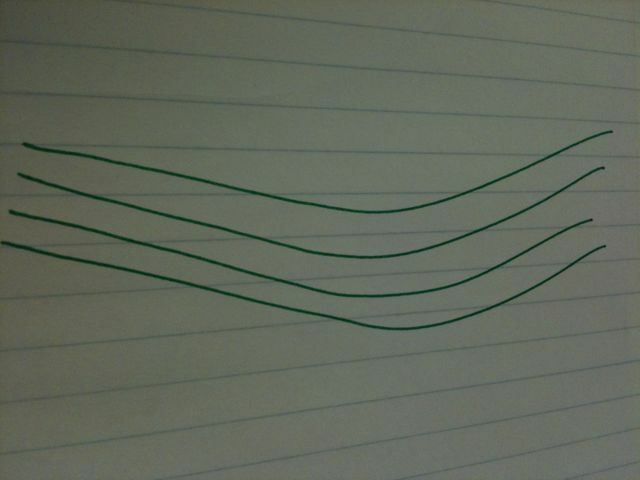 The first pleat was beautiful. The rest of the pleats are one fat droopy, slobbery mess. Ok, there was no actual drool involved, but if pleats could drool, these would be dripping oceans of drool. My skirt needs a makeover. HELP!!! Any and all suggestions will be desperately accepted. Thank you! I am a little late in writing this post about my lesson last week, but better late than never. And a warning – this is a long post. Faye shared: “I am in the SAME boat … I still need clothes so I sew for where I am now, and will when I do lose the weight, I’ll sew for where I am then.” I know you’re right, that I should sew for the body I have now, but I don’t want to. *stamping foot like a toddler in the middle of a temper tantrum* My urge to sew is negatively correlated to how out of shape I am, unfortunately. Ugh! Sue suggested: “… none of us are going to fit into any clothing/pattern without some tweaking.” As I shared with Karen on the phone the other night, I stupidly assumed that, after the sz 14 turned out to be too small, of course the sz 16 would be just right and would require no tweaking at all. WRONG! Robin mentioned: “I have TNT patterns that I use over and over. When I want a new style, I work out a frankenpattern, rather than try to sew a muslin from a commercial pattern.” I haven’t been sewing (i.e., producing) long enough to have any TNT patterns yet. 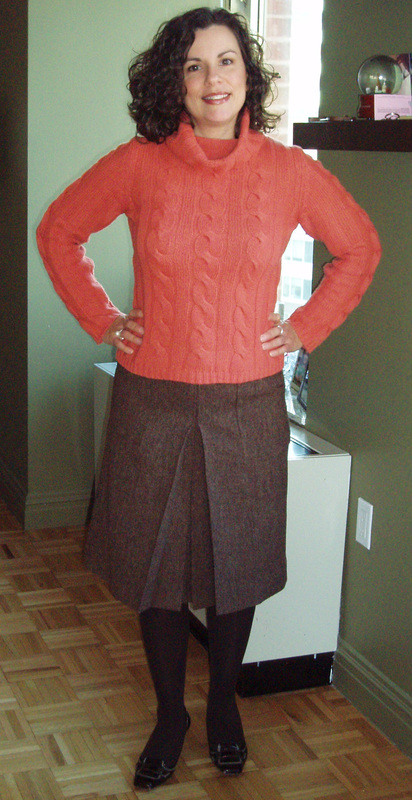 In fact, muslining the Simplicity skirt was my first attempt to find a TNT pencil skirt (post on TNT’s still in the works). Read on further in this post, however, for more progress on this front. 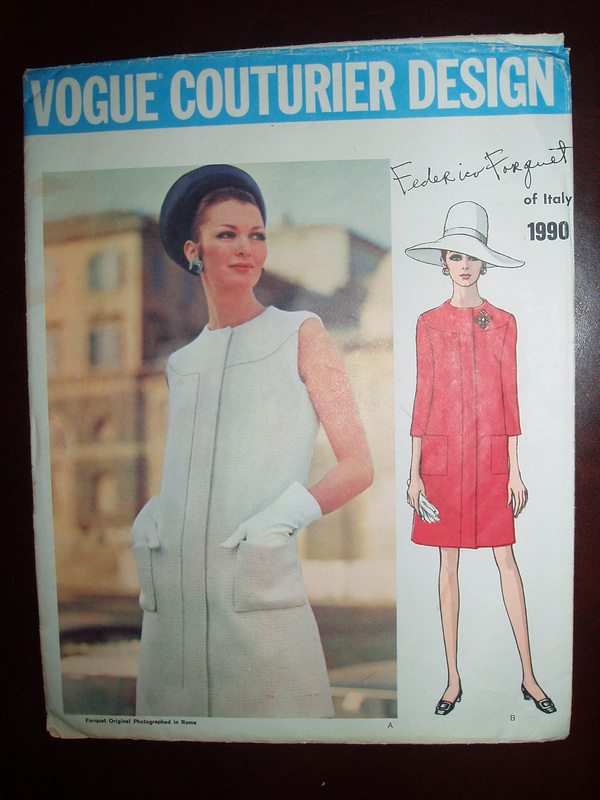 Hatty pointed out: “Oh and another thing — what’s in your construction queue — that Burda cardi/jacket thing — that’s a definite no-no unless you are feeling devastatingly attractive and tall and willowy.” OMG! You’re right! I am taking that out of the queue pronto. Thanks for saving me from some more frumpy angst! Helen bravely brought up: “You know, underneath all the stuff about your size there is that disturbing comment about ‘not expecting to date’ for some time, which we are all politely ignoring because it is so worrying.” You are right too Helen, I should not feel that I have to be skinny to date, but while I understand that, I still can’t feel motivation to date when I don’t feel good about myself. It’s a little bit of a catch 22. But hopefully, after somehow working in working out again, I will feel better about myself and feel the urge to get out into the fray again. The problem is, though, as a single parent, it’s hard to find time to work out without having to pay a babysitter to do so. I can do it, but it’s a tricky business, can be expensive and you have to be extremely motivated work it into your schedule. JC asked: “Did you enjoy your sew fast sew easy class? Yes, I did. I wrote a couple of posts about the projects I worked on in that class where I detail what I learned. Check them out! I highly recommend their classes. However, one of the reasons I have Thea as my teacher now is that she comes to my apartment so I don’t have to pay babysitting on top of the class fee. I haven’t finished the skirt so no pictures yet. Be patient dear readers. Next I tried on the knit top for Thea and she thought it looked just fine on me. She thought the pulling/wrinkles on the bust were part of the drape and didn’t bother her at all. She liked the top. I looked at it again with kinder eyes and just may agree. Although I am waffling on it since I still feel self conscious about my thick middle section. 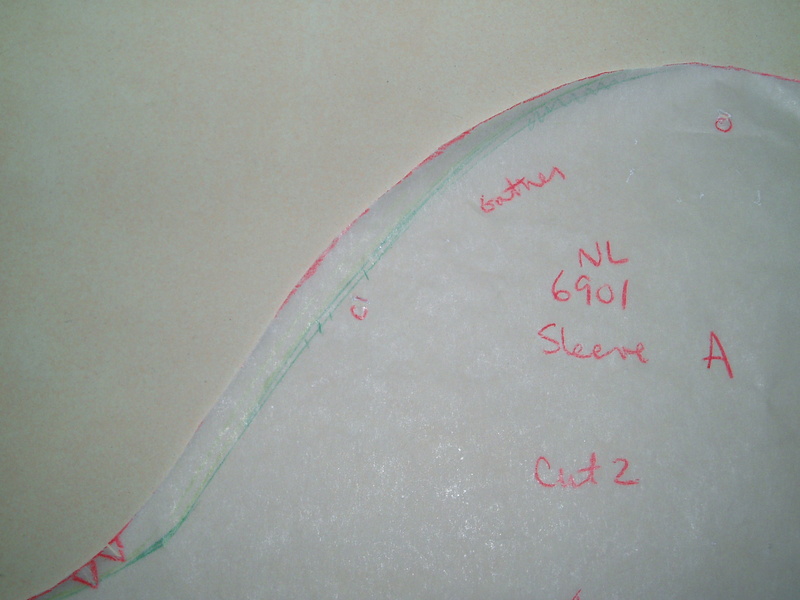 Thea said we could add a little more to the side seams on the front pattern piece under the arms for more room for the bust and see what happens. 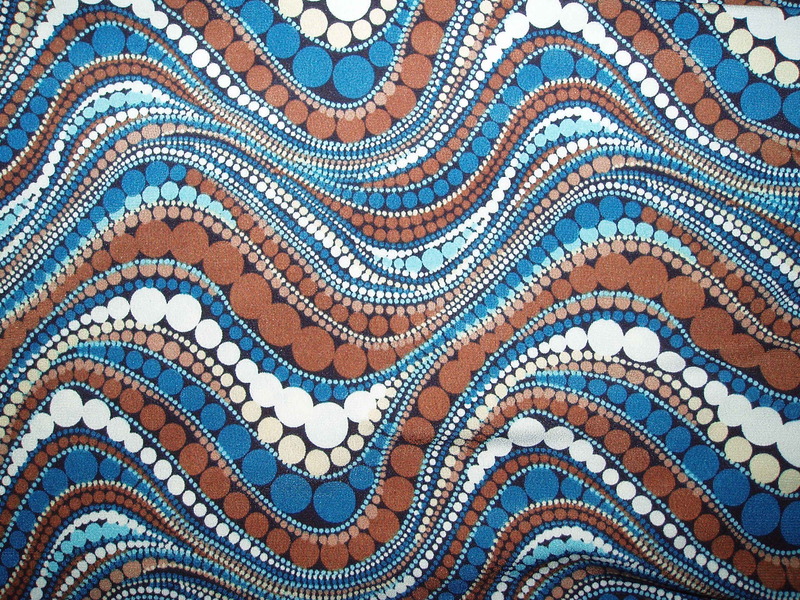 I think I may try that in my ugly dots knit fabric. Again, I don’t want to waste any of my nice knits on another muslin. 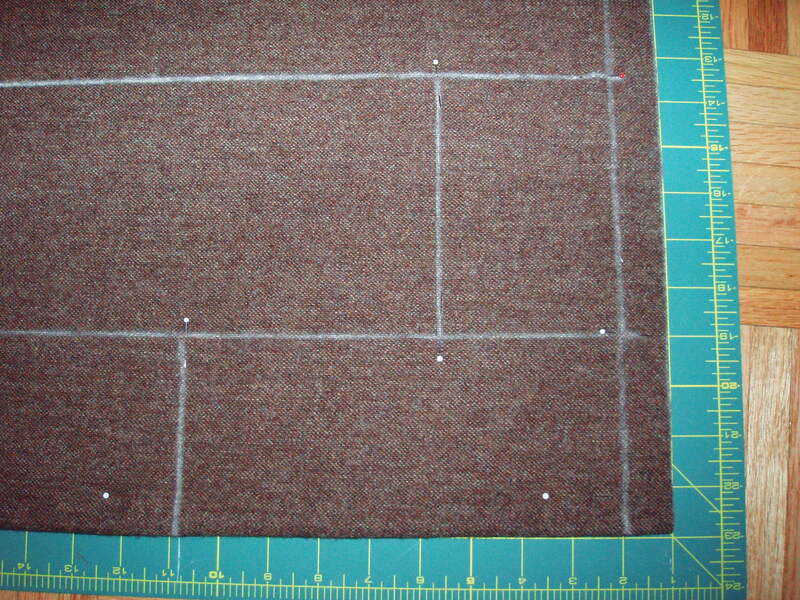 While Thea was there, I sewed on one of the sleeves and I had my first experience of too much sleeve cap ease. New Look requires you to gather the sleeve cap before inserting the sleeve. Ridiculous! 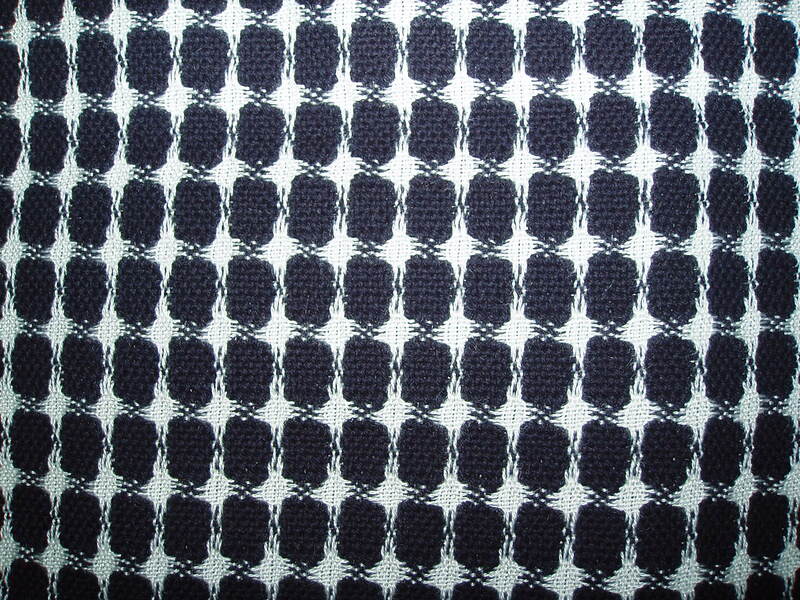 It’s a pattern for a knit fabric people! How about just drafting a knit sleeve cap that fits into the armscye? Brilliant idea. Now let’s do that from now on. 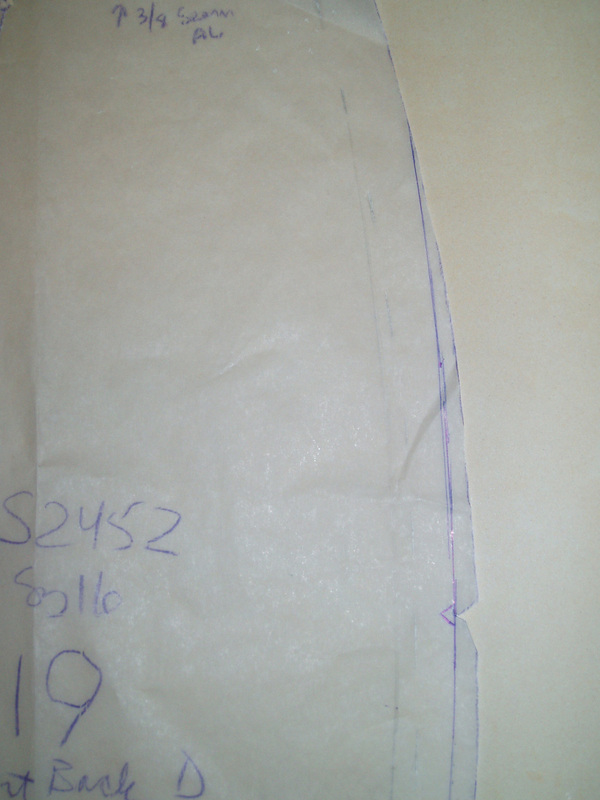 I asked Thea to redraw the sleeve cap as I hadn’t a clue as to how to do that. 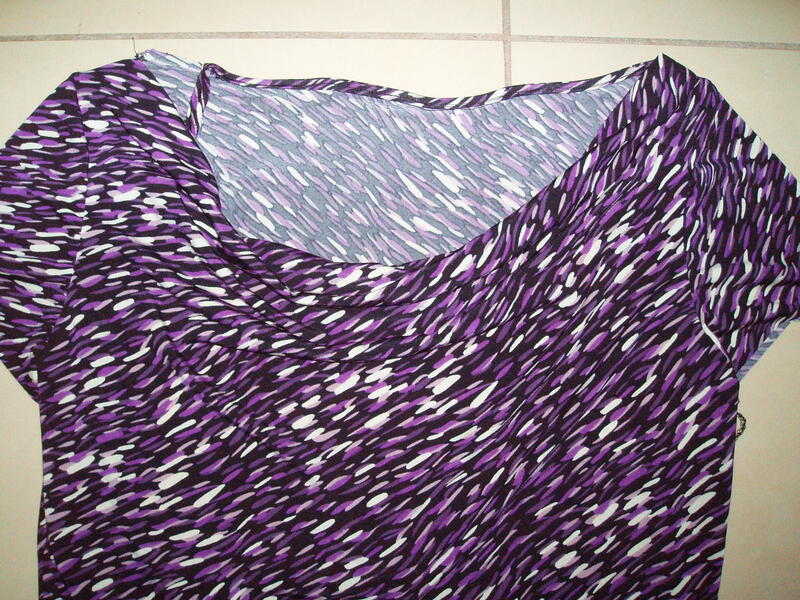 I’ll try it out the new sleeve along with the new front pattern piece on my next iteration of this top. 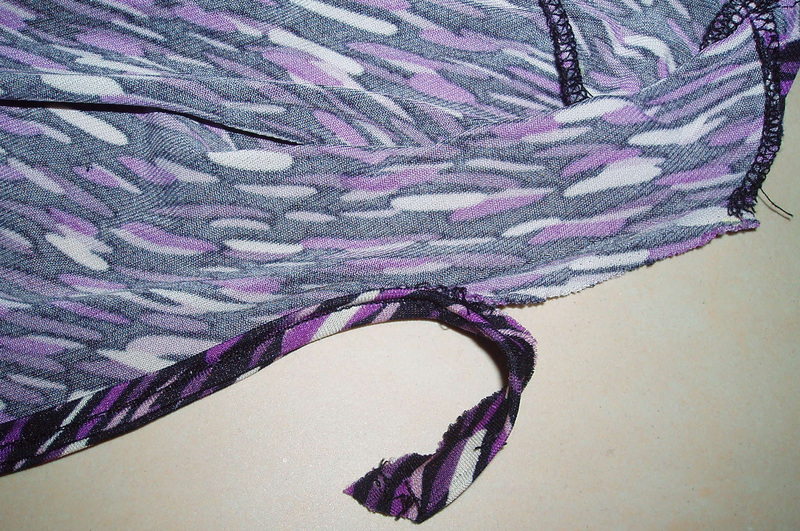 I thought I could salvage this top by removing the back neck facing and finishing it in another fashion, but I can’t remove the facing for the life of me. It’s on there but good. I could only get two inches unattached. I am admitting defeat with this iteration. The reason why I am working so hard to make this top and skirt work is simple. TNT’s people. I need ’em. I want ’em. They’re worth the effort, the tweaking. 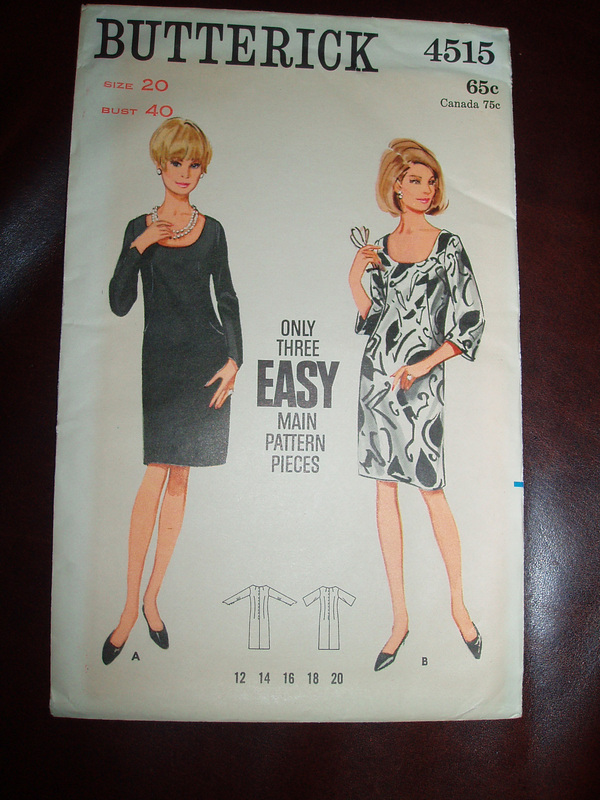 Once I get these two patterns working for me for how I look now, (*sigh*) I can start ramping up the wardrobe factory production because I need a lot more work clothes. A lot. I am sick and tired of what’s in the rotation. I want some variety and more of it. And I want it NOW!!! And to be truthful, it isn’t hard to make these patterns work for me and my body. 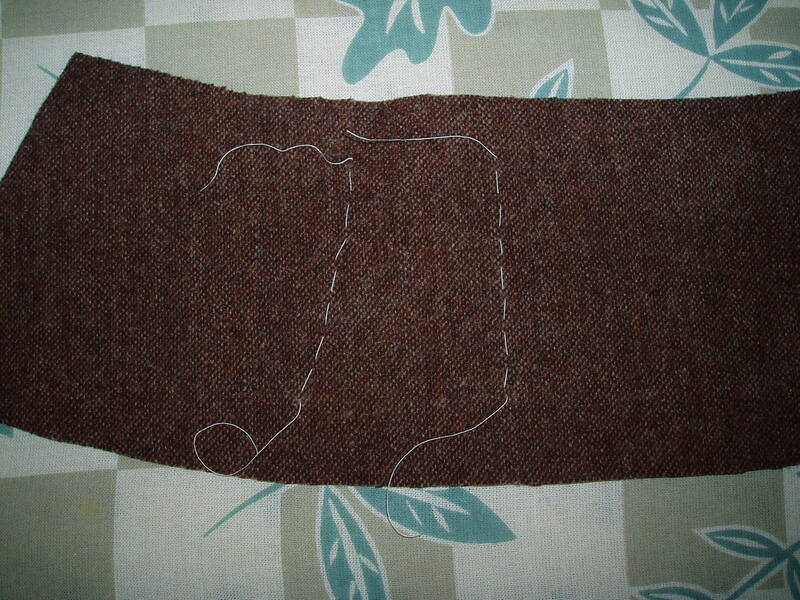 The changes are simple and easy, so it’s not like I am redrafting the pattern. I just became easily discouraged at first. I was focusing on the wrong thing, my body, not the fit of the pattern. Not that I shouldn’t get in shape or anything, but I can and will sew for the body I have now. It will take time and much effort to get back to where I want to be, shape-wise, and I am going to need to clothe myself in the interim. So I better get cracking! So I am going to do a little poll with New Look 6901. 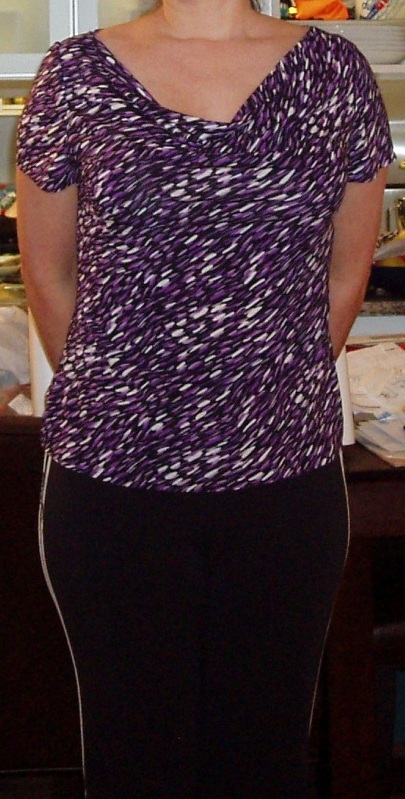 I will show you a picture of me wearing the top and you let me know via the poll what you think. Deal? Oh and I almost forgot! 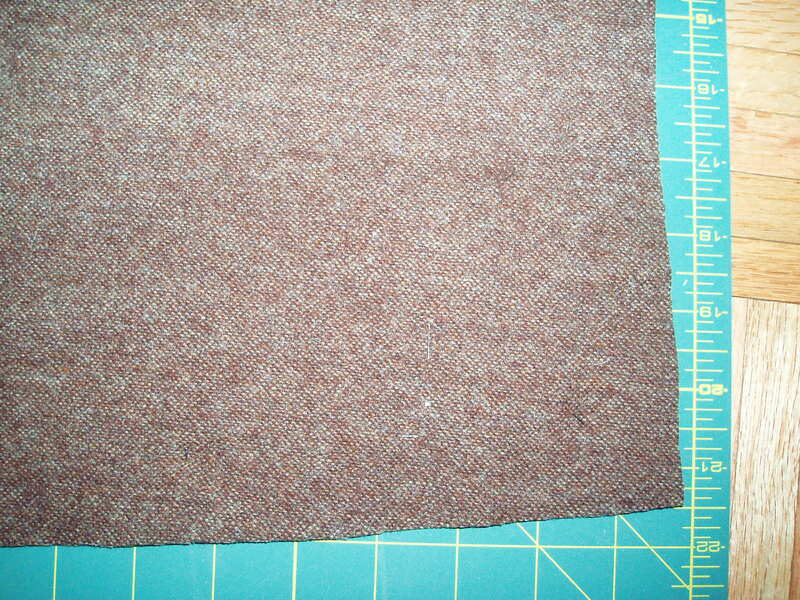 Thea also looked at my alhambra clover fabric that was printed off-grain. She thinks it just needs a better pressing than I gave it previously and it should be fine. Wow! I can’t tell you how relieved I was. 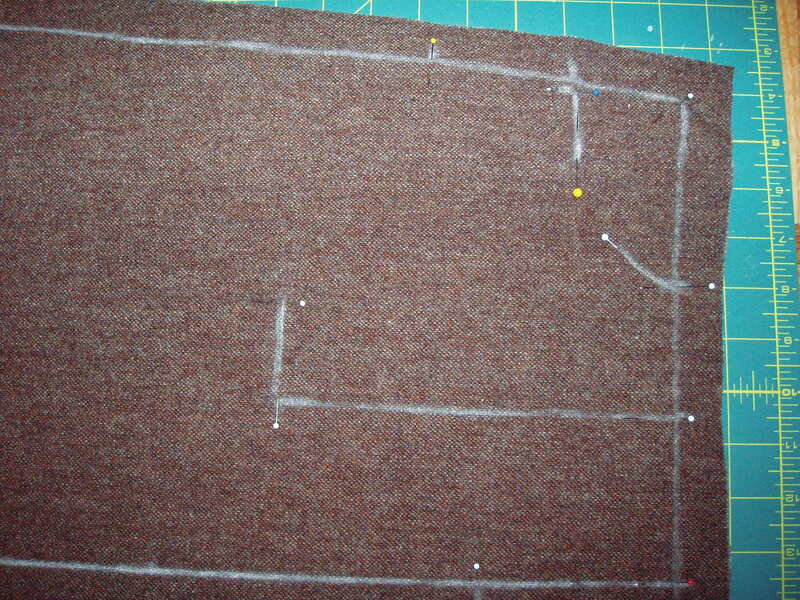 However, I think I need a little time off from this fabric for a while before I reattempt cutting it again. We need a break from each other. New Obsession and Impromptu Meetup! 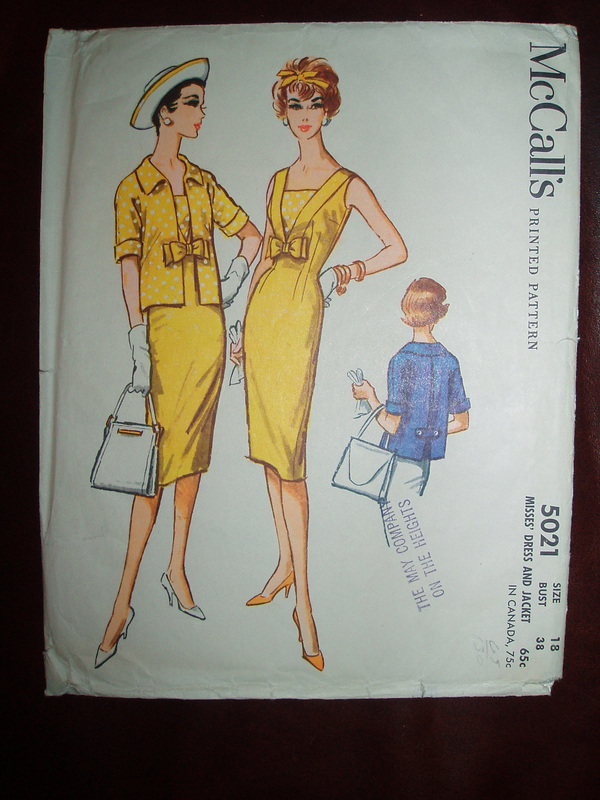 Carolyn’s post of a few weeks ago catapulted me into a new realm of sewing I had heretofore managed to resist, vintage patterns. After perusing her friend’s vintage pattern site, The Blue Gardenia, and falling in love with a few patterns there, I succumbed. 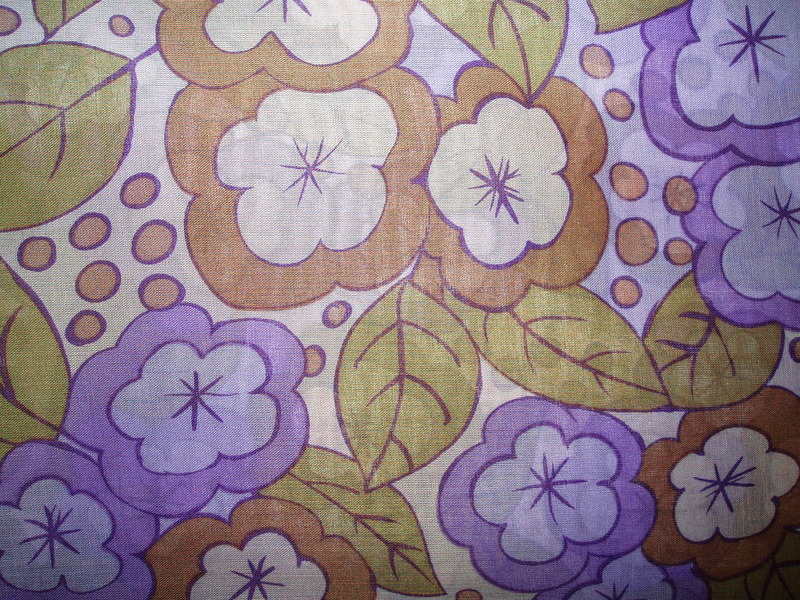 So now my new obsession is vintage patterns. Good thing I’m on a budget now, otherwise I would be OUT. OF. CONTROL!!! Then Carolyn introduced me to Mood. 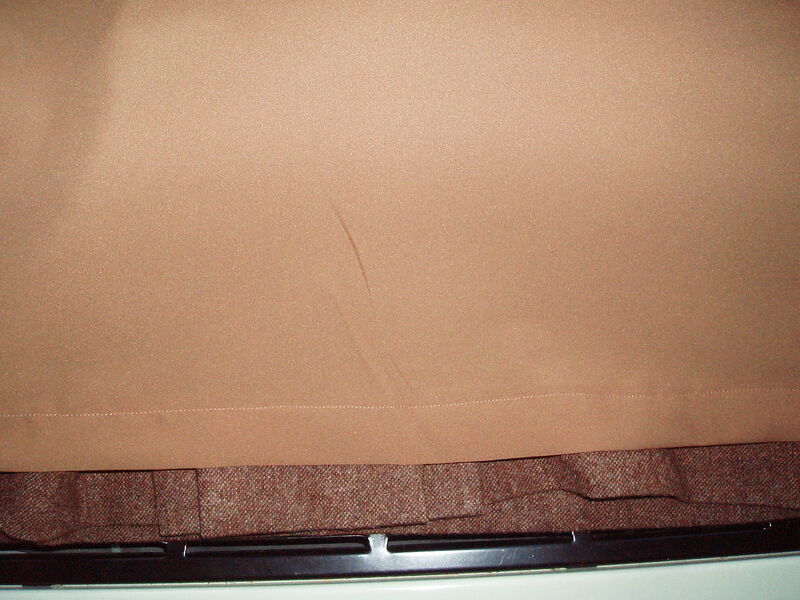 I had never gone before as I had heard that their service was bad and the fabric wasn’t marked adequately. Well, apparently things at Mood have changed dramatically. 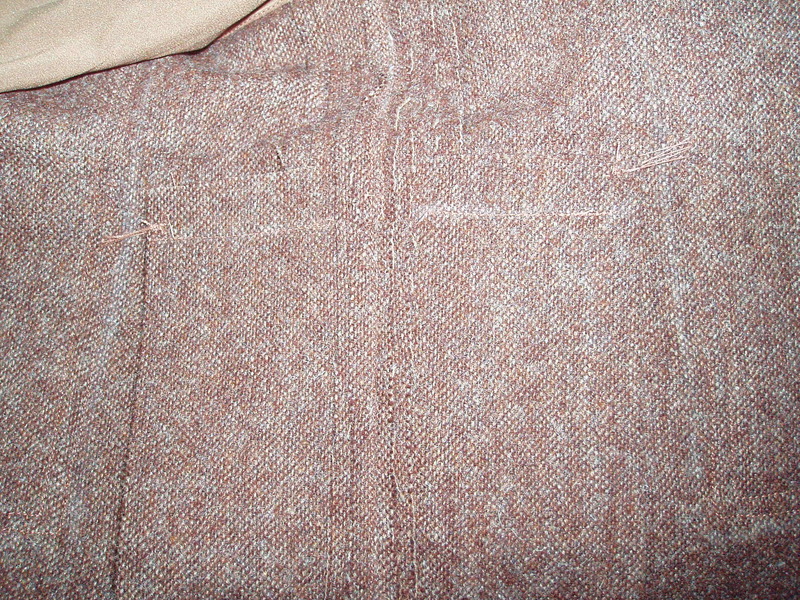 Each fabric section was marked clearly. There were at least two staff people on hand in each section and all were very helpful. The only customer service problem I saw was the need for more people at the registers — a small concern considering everything else. 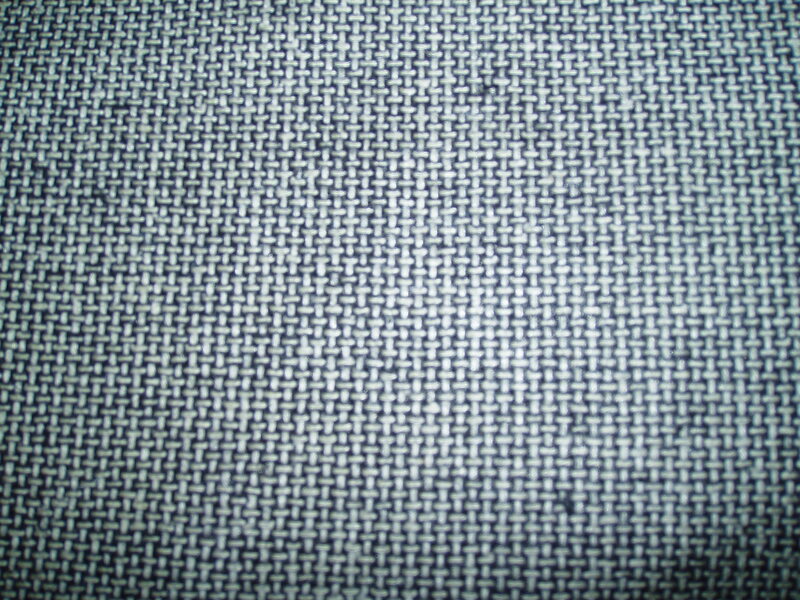 Oh and let’s not forget the wonderful selection and quality of fabrics to be had there. I saw a gray suiting with a lavender pinstripe that I was dying to own. 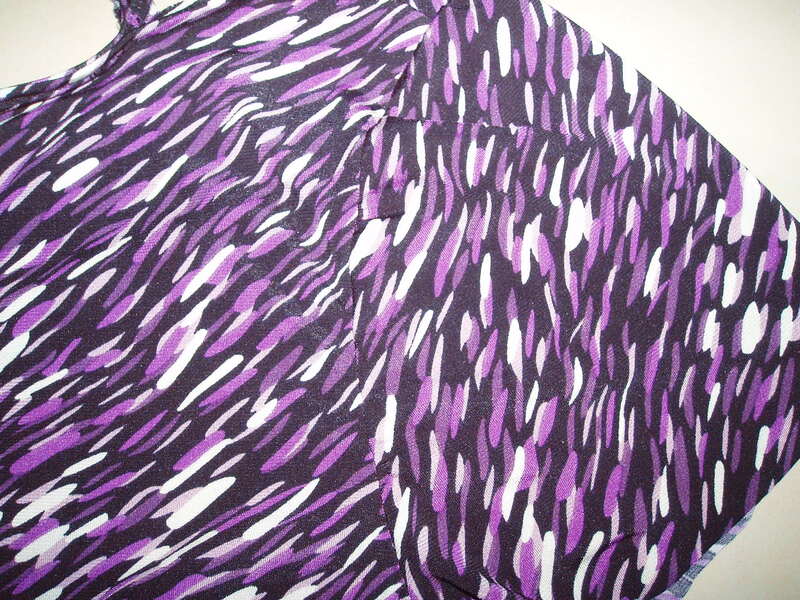 And a wool Challis with a gorgeous abstract purple and gray print that sang to me as I passed by. I showed it to Carolyn and she took a cut home with her. *sigh of longing* I can’t wait to see the dress she’ll make with that piece. It will be stunning! So, I am sold on Mood and will visit again when I am not on a strict budget (which should be about 2025). 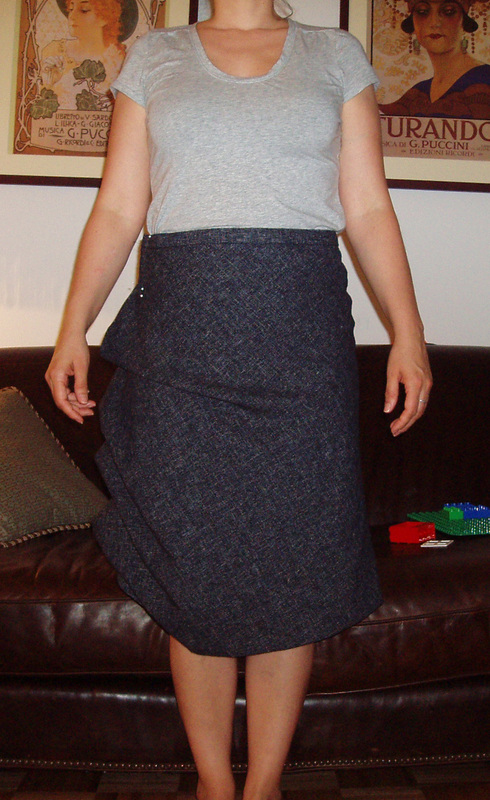 I am still working on my Burda skirt. 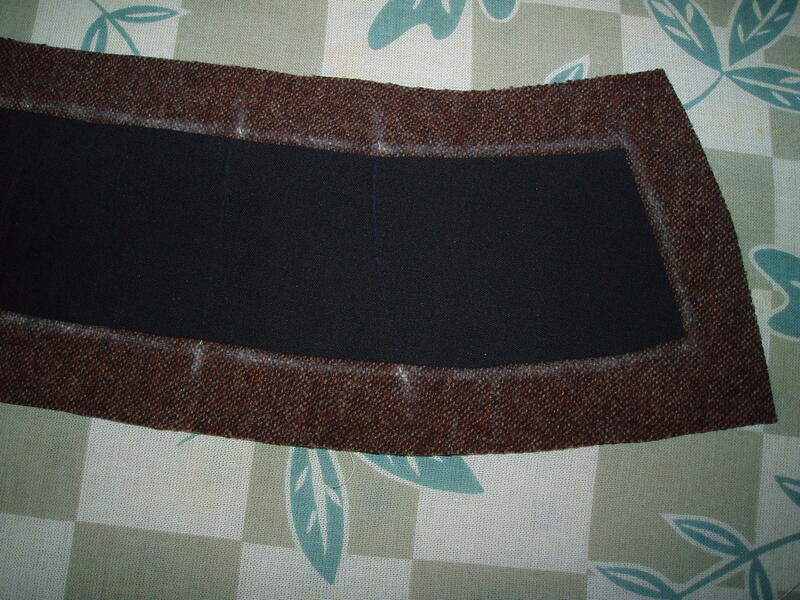 I am taking it slow; I want to make a very professional looking garment. 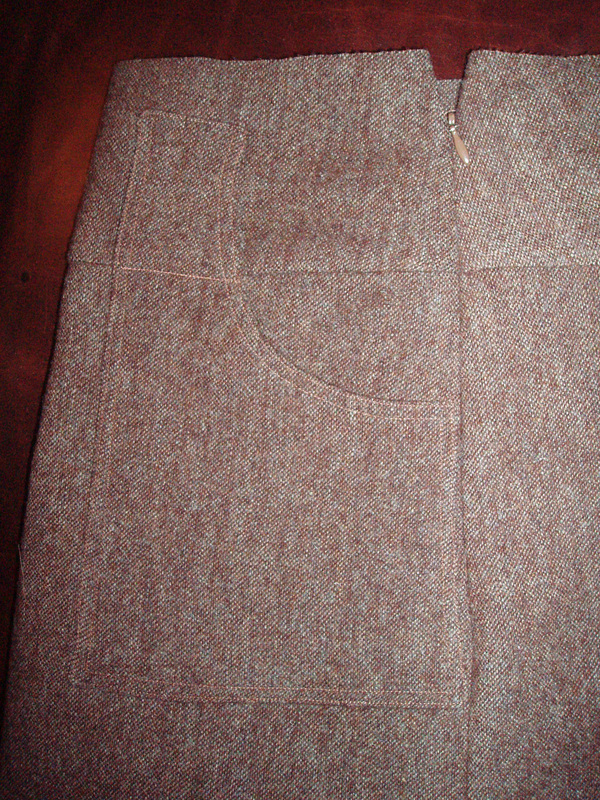 Last night I sewed the darts and sewed up the pleats. 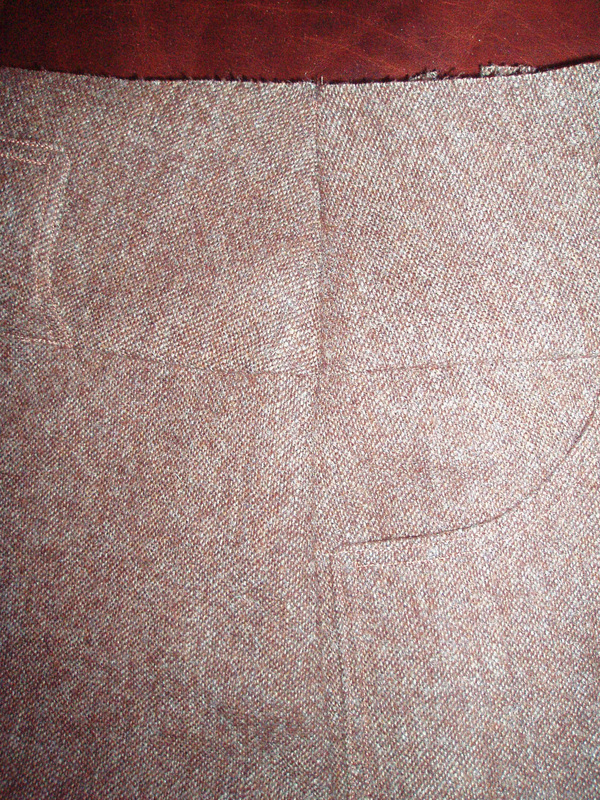 The tweed, surprisingly, takes to pressing well and I have really crisp looking pleats now. I love it! I thought I would hate working with this fabric, but I am really pleased with the hand, and stability of it, and how nicely it takes to pleating. Who knew?! 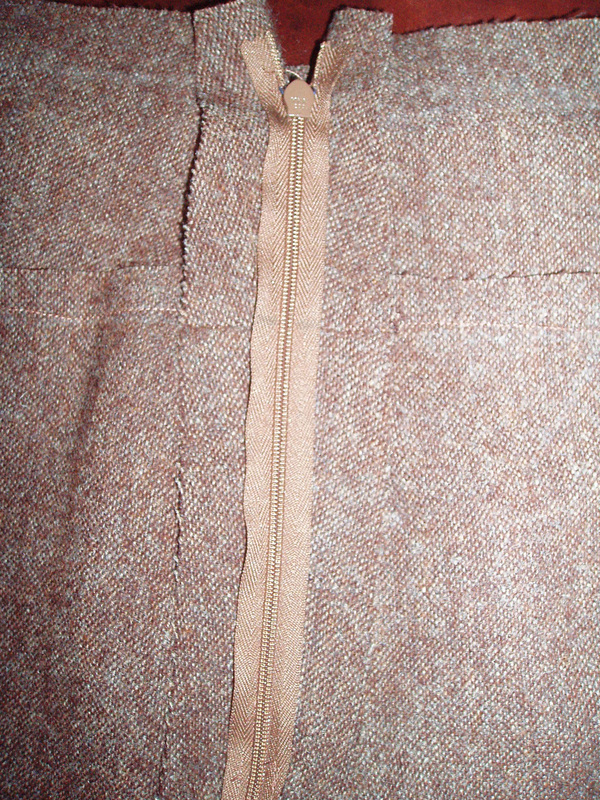 Tonight, I’m on to making and attaching the pockets (they’re lined) and attaching the waistband. Yippee!